At Sherman Oaks Dental, we strive to provide our clients with high-quality dental services and individualized care. We listen to every one of our patients and what their concerns are. We offer many dental services including teeth whitening services. As your Naperville cosmetic dentist, we want to do everything we can to help you get the smile you want. We offer many teeth whitening services. We realize that there are many remedies out there when it comes to teeth whitening. But, the options we provide are much stronger, safer, and produce better results. Teeth whitening involves applying a bleach solution to teeth. The bleach attacks the colored organic molecules and breaks them down. You usually leave this solution on for a half-hour to an hour. Teeth whitening procedures are generally safe as the chemicals do not attack the structure of the actual tooth. Having your teeth whitened at the dentist, or using materials your Naperville cosmetic dentist gives you, is much safer. What Teeth Whitening Systems Are Out There? At Sherman Oaks Dental, we can provide clients with individual advice that suits their needs and oral hygiene history. Dr. Weyneth will talk to you and figure out the best teeth whitening option for you. He can recommend the best and safest tooth whitening products. Or, we can provide in-office procedures that are even stronger and more effective. It is always safest to consult with your dentist before using any new product on your teeth. Sherman Oaks Dental offers in-office whitening system and take-home whitening systems. In-office systems are highly-concentrated gels you wear for about an hour. You can also get take-home whitening systems after a we make a custom mouth tray in our office. Both of these options can achieve great results, and we are able to use more effective products with your safety and comfort in mind. 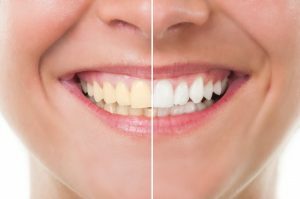 Over-the-counter teeth whitening products contain lower concentrations of bleach and can take longer to see any results. They also are not administered or under advisement of a dentist which means there is a risk for improper use. If you have any questions about teeth whitening systems, do not hesitate to give us a call. We are happy to inform you about the different options we provide. Also, our Sherman Oaks Dental front desk staff will be glad to schedule you an appointment for our teeth whitening services. Dr. Weyneth, one of the best dentsits in Naperville, can figure out the best solution for you to get a whiter, brighter smile.